Enjoying a mellow rest day in Golden, BC after a few epic cold-smoke sessions at Roger's Pass. Holeee hell... It was deep! 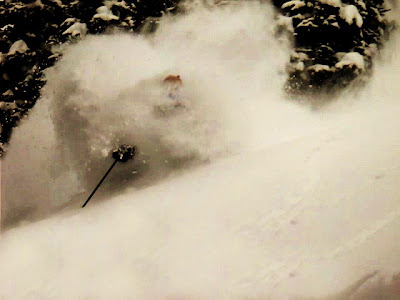 I forgot what it was like to ski bottomless powder with face shots on every turn. On Dec 28th, a huge group of us met at the Visitor Center with 35 cm's of white gold lying on the ground. In a frantic dash, we headed towards the Teddy Bear Trees. As often happens in large, unwieldy groups, no one really knew what was going on and before too long, we were struggling to put in a thigh to neck deep up-track. Feck this I thought! 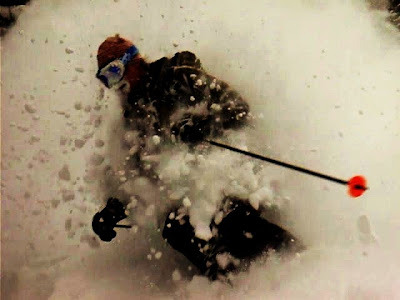 Today is for skiing, not for breaking trail. So in a rash moment of spastic rebellion, I admitted defeat and declared, "I'm going over to Grizzly Shoulder! Who's coming with?" Natalie Renner joined me and in a terribly anti-social move (apologies to all), we skinned over to the Grrizzly Shoulder Super Highway. Once out of the initial kafuffle, Nat and I questioned the ethics of leaving our friends. One hour later, as we were choking on steep, untracked face shots, we completely forgot about our friends. 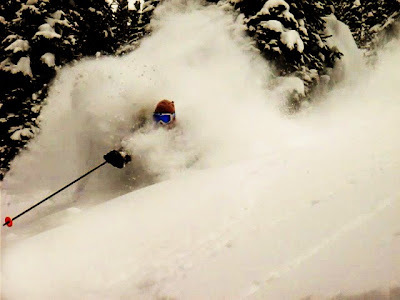 In hindsight, I would say that this mental flexibility supports the age old adage that, "There are no friends on a powder day!"